For those of you who don't know, your Miss Emma Emerson is an architect. Which means, graduate school was involved. Which means booze was necessary. The preferred poison was Jameson, and we still give it all credit for subsequent successes in academia, and in life. Needless to say, we are fans. First of all, let us say how wonderful and lovely both Liam and Ger were - charming men who have devoted themselves to this brand, not only as a whiskey, but as a family and as a way of living. (We understand the way of living part, we do). We discussed all things Jameson for a few hours, (which is another reason why Tales of the Cocktail is an incredible event) from the site in Ireland where it's made, the importance of copper stills, the types of barrels used, to a few of the Jameson Reserves, Black and Gold. Team Jameson was interested in providing a Reserve line designed for the Jameson lover (us), but a bigger, bolder version of the original. We tasted two marks, the Black Barrel Select Reserve, retailing at $44 a bottle, and the Gold Reserve, retailing around $70. First to the Jameson Black Barrel. Jameson has created an exceptional product, flavors of granny smith apple, wood spice, pepper, cinnamon, with some leathery notes, which are credited to the Sherry casks that part of the spirit is aged in. The Black Barrel is very smooth to drink, full of flavor, and finishes long and smooth. Speaking of casks, they were able to create this seductive blend by combining a specific proportion of pot still whiskey and rare small batch gran whiskey, aged an average of 12 years in different types of barrels - ranging from new Oak char, re-used American Bourbon Oak barrels, and re-used Sherry European Oak barrels. What was inspiring to this lady was the science of it. Many years ago, we fell in love with Single Barrels. The bourbon from one barrel tasted wildly different from the next. But with blends, so much of that unique barrel flavor is instead used to help build the blend, which in turn is the identity of the brand. The Master Blenders then taste each barrel, taste the combinations, and make sure that the blends are consistent. With an enormous brand such as Jameson, there is a science to it (Liam is a Chemist after all), all of which is secret of course. The details are critically important - how long they take to re-fill barrels that have arrived from Kentucky (3-4 days), the process of distilling the whiskey, and the care of the Sherry barrels coming from Spain. In fact, Jameson works with the company in Spain to ensure the consistency of those barrels. Whiskey, like wine, is alive - and the symbiotic relationship between the grain spirit, the raw materials of the charred wood and the copper, and the triple distillation process are what make Jameson a consistent and high quality whiskey. They never allow their casks to sit outdoors, and take great care to maintain them. Enter Ger, Master Cooper, a mulit-generational cooperage. 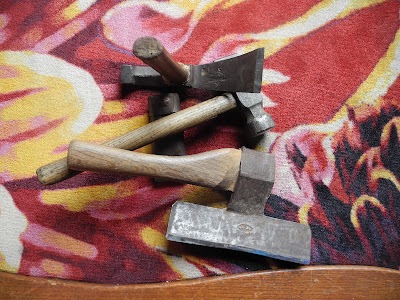 He shared a bit of how he works with the casks, breaking them down, repairing them, putting them back together. We were surprised to learn how these casks are so handmade, especially in this age of CNC and 5 axis robot technology. 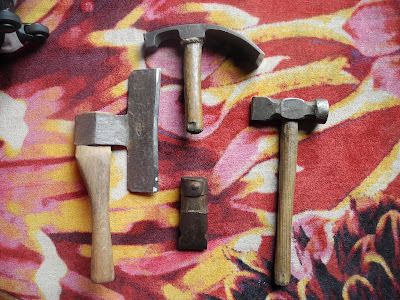 Ger shared with us some of his great-grandfather's tools, which were some of the most impressive tools we've ever seen. (We take no credit for the carpet choice, it's not our fault people). 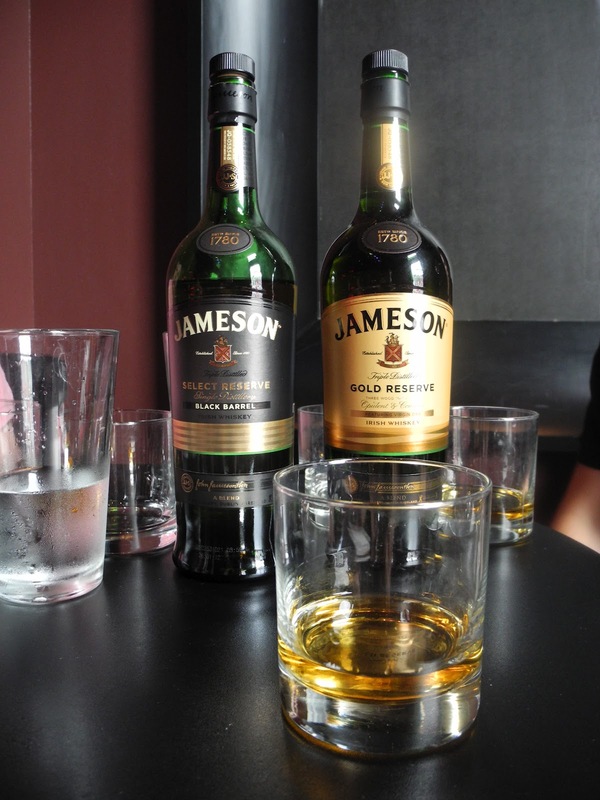 A final taste of the Jameson Gold Reserve to finish of the wonderful afternoon, which was more spicy and peppery, more hot on the mouth, significantly sweeter, and with strong flavors of apple, pear, and butterscotch. This mark is closer to a Bourbon because it is aged in new-char American Oak barrels, giving it more vanilla flavors than most scotches. We have to thank Liam and Ger for their time and their generosity. It was such a treat to meet the professionals from the world's most popular whiskey who make their product like it's an artisinal small batch. It's a comfort to know that our beloved Jameson is made with as much care as any small brand out there, if not more. Cheers to that! um, a distilled spirit isn't alive the same way a fermented beverage like wine or beer is. Chemical changes may occur, but no metabolism is taking place. It is "living" only in the metaphorical sense. Very nice piece Emma- I also like your views on how "alive" whiskey is!! Magic of maturation.